In the spring many farmers sow seeds anticipating an abundant harvest in the fall. Little do we comprehend the importance of our involvement in the expansion of God’s kingdom until we recognize all the fragments that fall into place. Brian Erland graduated from Penn State in 1997. Upon graduation he secured a position as youth minister with his home congregation in Bethlehem, PA. His focus was to challenge the high school youth group to seek after God and make a difference in their community and church. He was able to disciple two young men (Nate and Kevin) who became catalysts for advancing the kingdom at Penn State-Berks campus in Reading, PA. Meanwhile, in the same year God directed James Barnes to come to Penn State–University Park to begin studies in Electrical Engineering. After one semester he decided to go home to Berks and finish his basic degree requirements before pursuing his final two years at the University Park campus. While at Berks, James, along with some friends, led a Bible study and worship with several Christian students on campus. On several occasions Buzz Roberts, campus minister with CSF at Penn State–University Park was invited to speak to the small group and challenged them to make a difference on campus. Eventually these students made their way to University Park campus and left a legacy of impacting the world at Berks. Meanwhile, Nate and Kevin graduated from high school, and began to attend Penn State-Berks. Their involvement in many activities included leading the group to spiritual and numerical growth. 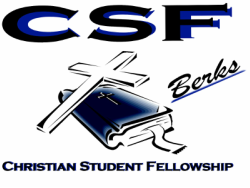 As spring semester 2000 approached, the Berks fellowship asked if they could join CSF-University Park on their spring break mission trip to North Carolina. Ten students joined forty-five others from the University Park campus and together served the people of Tarboro by helping them rebuild form the destruction of Hurricane Floyd. God blessed their joint efforts through a wonderful bonding experience in the Lord. Upon returning to campus, the Berks student leadership discussed the need for a full time campus minister, nothing time restraints and lack of resources for meeting the groups spiritual needs. Toward the end of the semester the leadership team officially requested the CSFPA board of directors to consider helping them secure a full-time staff member for their fellowship. In June 2000, the board agreed to their request and officially granted affiliation status with the Christian Student Foundation. In the fall semester 2000 David Hershey transferred to Penn State-University Park after having done his first two years closer to home at the York campus. At University Park, Dave quickly got involved with CSF, due to the fact he shared an apartment with three of the student leaders. During the spring semester 2001, CSF-Berks again joined CSF-University Park on the spring break mission trip to North Carolina. On the trip Dave made some good friends with the Berks students, and he began praying that a campus minister would be found to lead the students at Berks. Over the course of the next year Dave wrestled with what to do after college, having felt the call to ministry in his life. He decided to attend Lincoln Christian Seminary in Illinois, and for the next three years he studied and grew in that environment. During that time he kept in touch with his friends at PSU, and as his third year of seminary began Dave was feeling that a return to CSF, this time as campus minister, might be where God was leading him. After much prayer, meeting with the board, and with students, Dave was hired as the first campus minister at Penn State Berks in the spring of 2005. The Berks fellowship has experienced significant growth over the years. Despite significant turnover on a campus of mostly freshman and sophomores, there are often 25-35 students at a Thursday night worship gathering. Many other students are involved in other ways, such as Tuesday night Bible study, small groups for accountability, service and outreach projects. Enrollment at the Berks campus has grown from 2,197 in 2000 to over 2,600 in 2010 and will push towards 3,000 in the near future. The college offers an increasing number of four-year degree programs, and because of these programs the number of upper classmen attending the campus will continue to grow. Please continue to keep the Berks fellowship in your prayers as they face the challenge of impacting the campus for Christ.